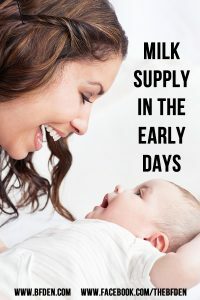 In the early days of breastfeeding many moms are concerned about their supply. Is this enough? How do I know? What do I need to do to make sure that my baby is not starving? In the first few days, babies will eat frequently. Their stomachs are very small. When they are first born, their stomach is the size of a marble and is capable of holding 5 – 7mL. FIVE TO SEVEN MILLILITERS! Wow. Keep that in mind. By day 5 their stomach is the size of a ping pong ball and can now hold 22 – 27mL. For those who need that in units of measure they can recognize, that means approximately .8 – .9 oz. That’s it. They can’t even hold an ounce of liquid. BUT the difference between 5 and 22? That’s HUGE. So your baby will need to eat frequently to make up that growth. Frequent feedings are not a sign that your baby isn’t getting enough milk. is your baby wetting diapers, we’re looking for 3 wet diapers a day by day 3 of life and by day 10 there should be 3 wet and 3 poopy diapers a day. your baby’s hands tell you SO much. Pay attention. Clenched fists are a stress sign. This can imply your baby is hungry. Splayed fingers are also a stress sign, but a sign your baby is overwhelmed and maybe getting too much milk at once. your baby’s demeanor. Is baby happy and content with mom? Does s/he relax between feedings? Babies are made to be with mom, they should be content relaxing skin to skin with mom between feedings. Does baby’s brow always seem furrowed? Does baby look stressed? These are signs there may be something not quite right and discussing your concerns with an International Board Certified Lactation Consultant or your child’s pediatrician would be helpful, just to have a second set of eyes on the situation. The biggest factor is your intuition. You are the expert on your baby. Trust your gut and follow your instincts. Breastfeeding your baby shouldn’t be a stressful time. Babies were born to breastfeed. Moms, however, need to learn about how it is done. Many generations ago we all would have sat around with friends and families all feeding their babies. These days most mothers never see a baby breastfeeding until they are handed their own baby in the hospital. 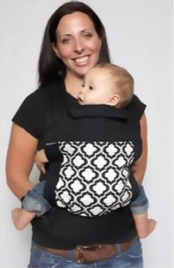 It may take time for you to learn and feel comfortable, and that is ok. Trust your baby, follow his/her cues and if you do have concerns, know the resources in the area. They are here to help.